That single-cup, or “k-cup,” coffee pod machine in the kitchen allows consumers to brew just one cup of the hot beverage they like. Now it’s also become a medical dispensary. TheraFlu is marketing Power Pods, in daytime and nighttime versions, that cold and flu sufferers can use to provide some symptom relief. “It’s the cold and flu fighting machine you put in your machine,” according to new commercials. “Our goal with the launch of PowerPods is to expand cold and flu remedies beyond the medicine cabinet and in the center of everyday wellness: the kitchen,” says Latisha Tillie, TheraFlu’s senior brand manager. TheraFlu will use TV, in-store signage, online video, social media, and influencer partnerships to promote the new pods. TheraFlu worked with a team of agencies on the campaign, including Saatchi & Saatchi (TV), Wunderman (digital), and other agencies for public relations, in-store and social media. A survey conducted by Harris Poll for CityMD urgent care centers shows millennials are much more likely to continued to venture outside than others (76% versus 56%) when experiencing flu-like symptoms. Another survey last year revealed more than half of millennials weren’t planning on getting a flu shot. 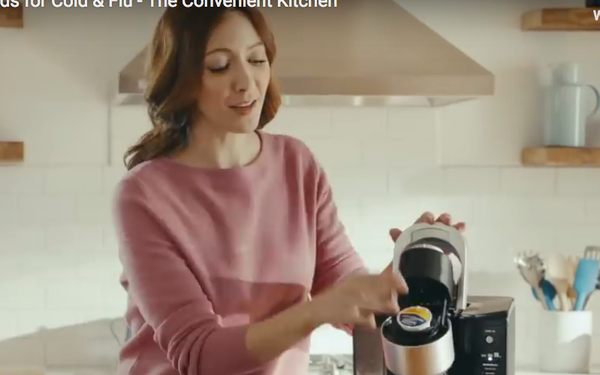 GlaxoSmithKline’s TheraFlu is going after a growing market of pod-type coffee makers, which also skews younger. According to a National Coffee Association survey in January, 26% of coffee drinkers had used a Keurig-like “single cup brewer” the day before, second only to the Mr.Coffee-type drip (45%). The same organization says 41% of U.S. households own a single-cup brewer system, up from just 7% in 2011. TheraFlu’s Power Pods work with most types of single-cup systems. The biggest difference is that each pod comes in a foil pouch as a child-safety measure. Since 2016 the brand has also worked with The Weather Channel and a company called Sickweather to create a tracker designed to provide real-time, localized updates on cold and flu outbreaks during the season. In addition. Tillie says TheraFlu has paid media on The Weather Channel properties through its app and website.